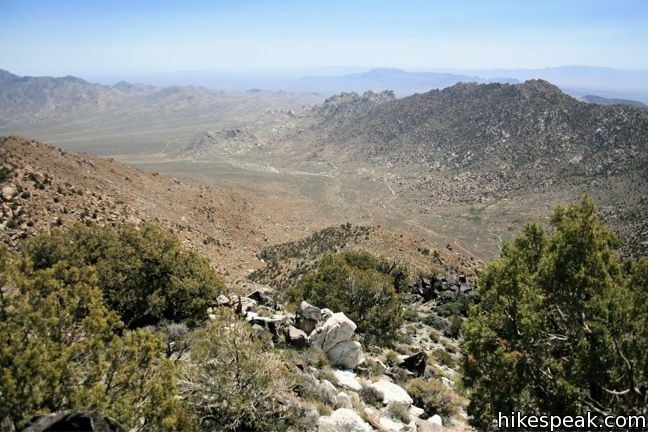 This 8.5-mile hike ascends 2,500 feet to summit a 6,365-foot peak in the small range of mountains in the southwestern corner of Mojave National Preserve. 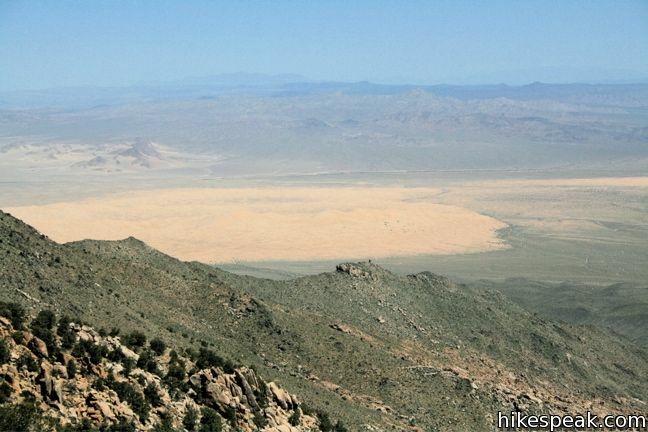 Silver Peak looks out across the Granite Mountains toward the Kelso Dunes, Cima Dome, and the peaks of the Providence Range – a worthy view of Mojave National Preserve to be sure. 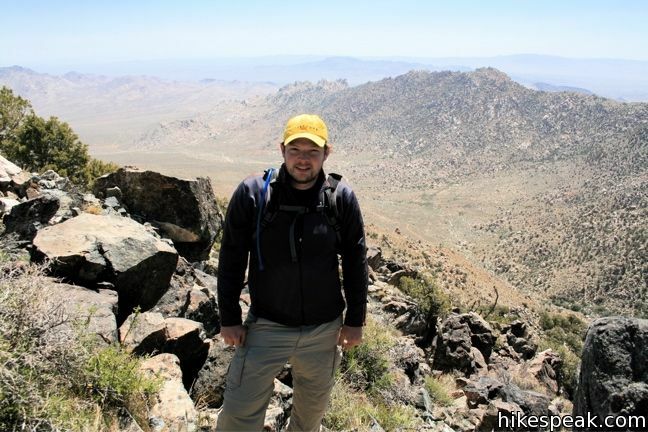 Nearby Granite Peak is the tallest mountain in the range (6,762 feet), but Silver Peak is an easier hike because there is a rough trail leading almost all the way to the summit. 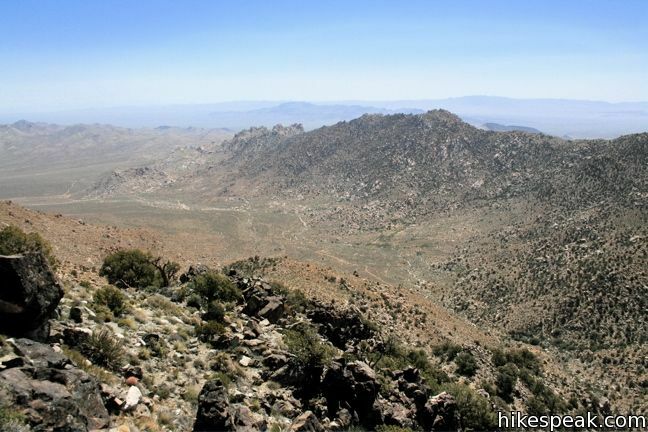 Those hiking to Granite Peak must leave the road to forge an off-trail cross-desert ascent through tough terrain (read Bob Burd’s report for more info on bagging this peak). 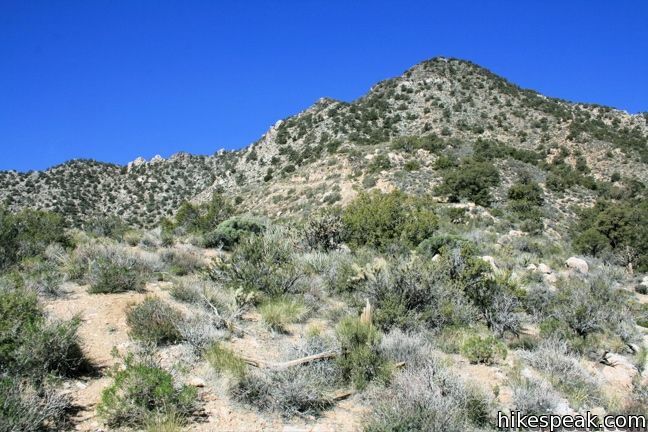 The trail to Silver Peak is unmarked, but easy to follow, if you pay attention to a few important directions. Just 1/4 mile from the trailhead, the trail/wash comes to a Y. 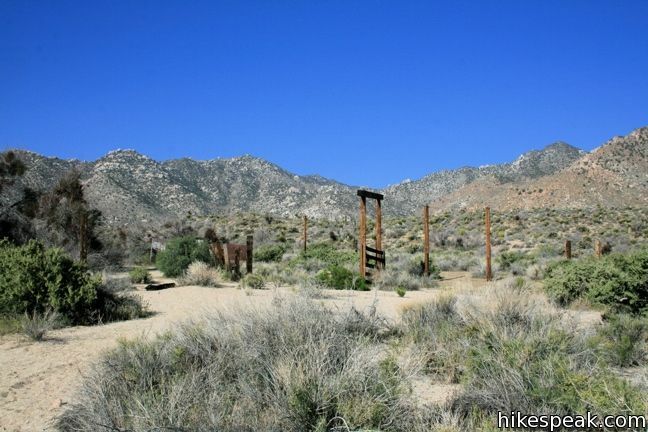 The remains of a corral at the site of an old ranch can be seen up the left fork, luring you that way. Instead, take the right fork, which quickly reveals itself to be a jeep trail. After a short distance the road passes to the right the corral. Feel free to jump trail and explore the ruins, but return to the road afterward. There are footprints continuing up the wash, but this is the more circuitous route to Silver Peak. 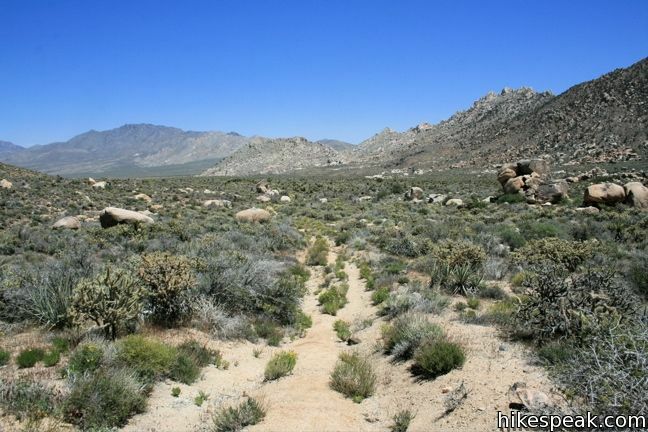 The wash passes through Cottonwood Springs, treating hikers to slower terrain and deceptive side-washes. 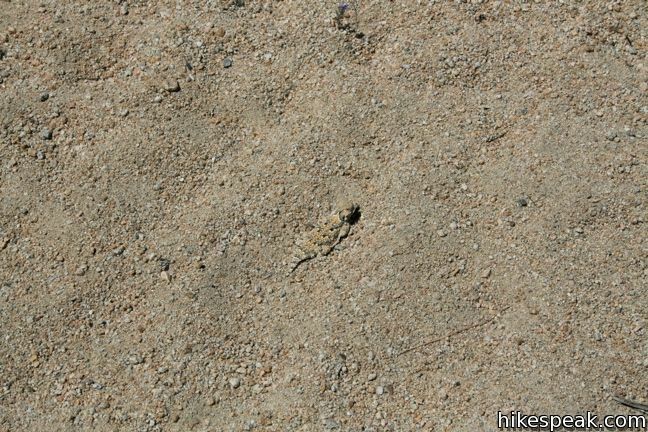 Stay on the road to the right of the corral, which is more direct and made of packed dirt instead of sand. 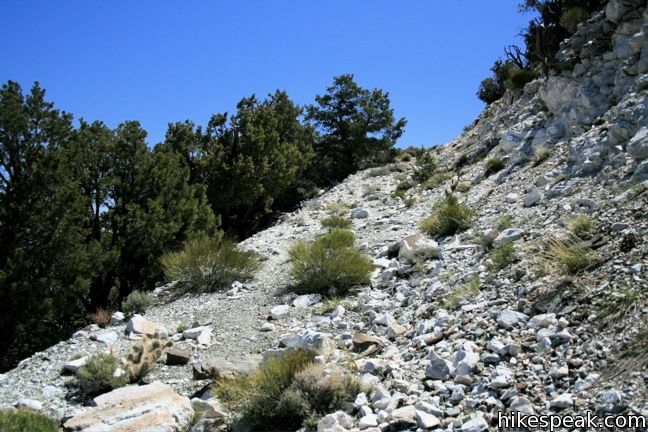 There are a few turns in the road, but by and large it is a straight gradual uphill hike to the base of Silver Peak. 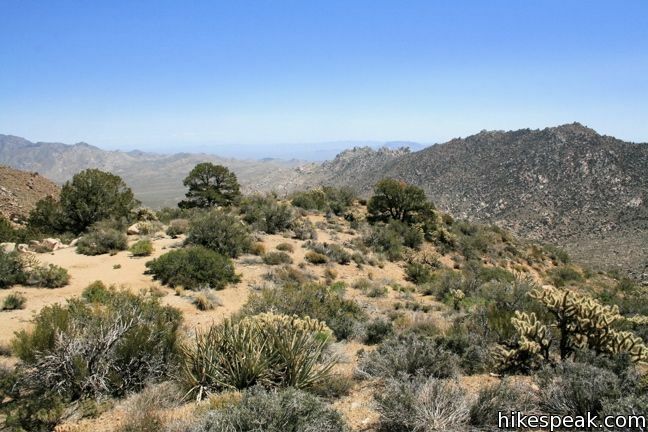 Hike up the tire ruts and enjoy the view of the surrounding mountains. 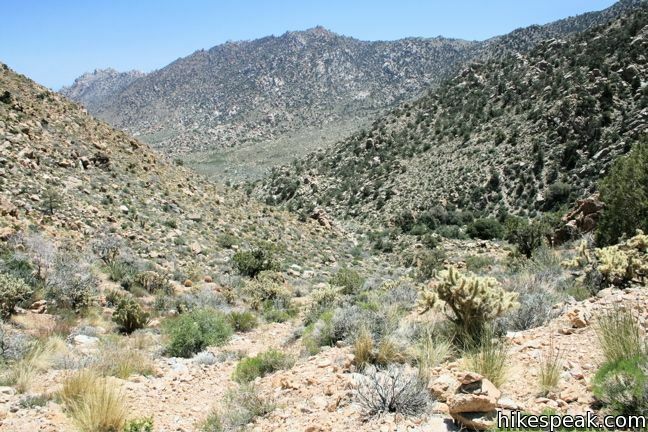 At 2.5 miles, the road crosses through the mouth of a brief canyon between ridges on the south side of the peak. Here the trail becomes a bit tricky to follow. 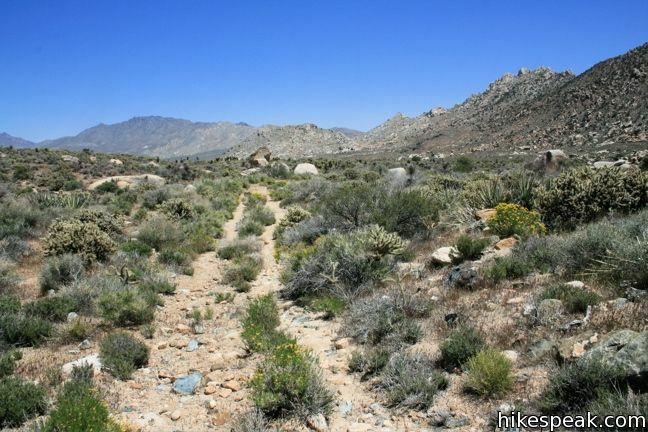 Referring to this section as a trail actually broadens the definition considerably. 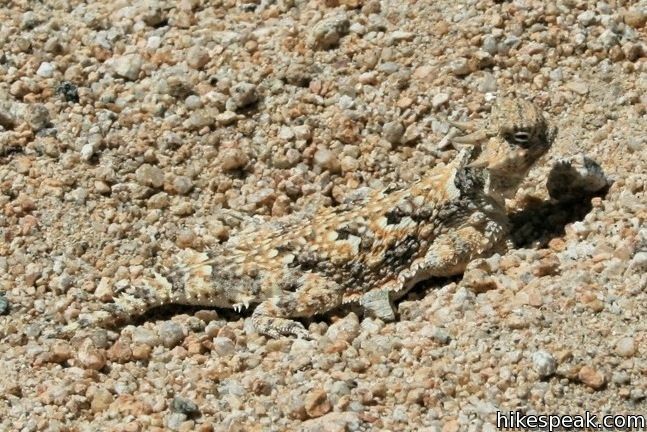 Stay observant and follow the footpath as it crosses from the right side of the canyon to the left. 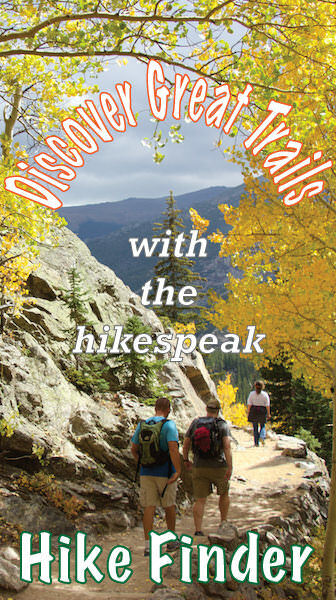 Pass through a stretch of high grasses and get a clear sense of how infrequently hikers visit Silver Peak. 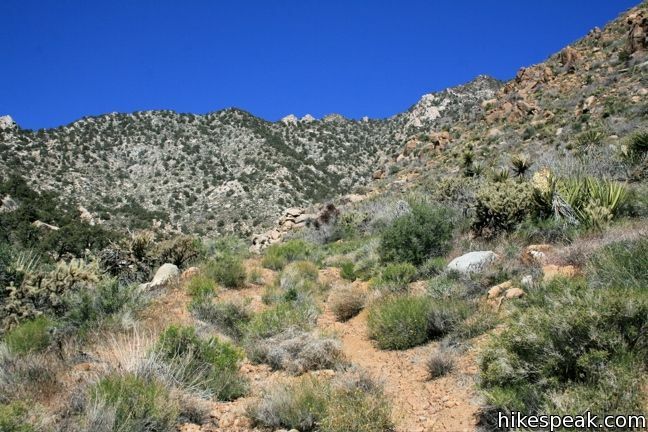 A quarter-mile farther, the trail comes back to center and begins a more serious ascent. 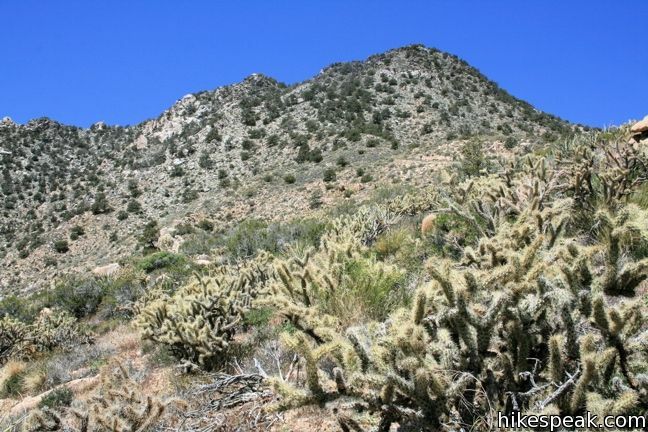 1500 feet remain to be climbed over the next 1.8 miles. Follow the cairns leading up a steep slope below the summit. Above, the line of the road can be seen crossing the mountain toward the east. March up the gravel slope and turn right, continuing up the road. 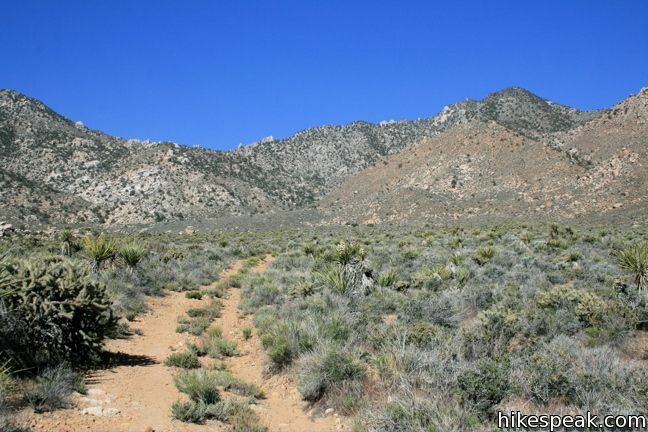 The trail becomes easy to follow again, as it carves up the ridge past a few landings were tents could be set up (3.2 miles from the start). 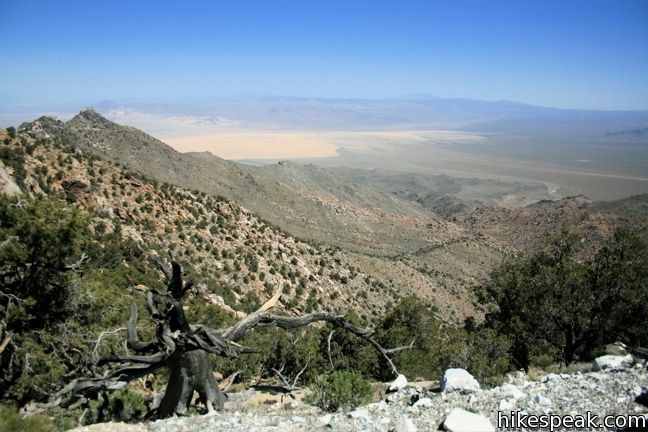 As the road progresses to the north, Pinyon pines replace the yucca and cacti of the lower desert. 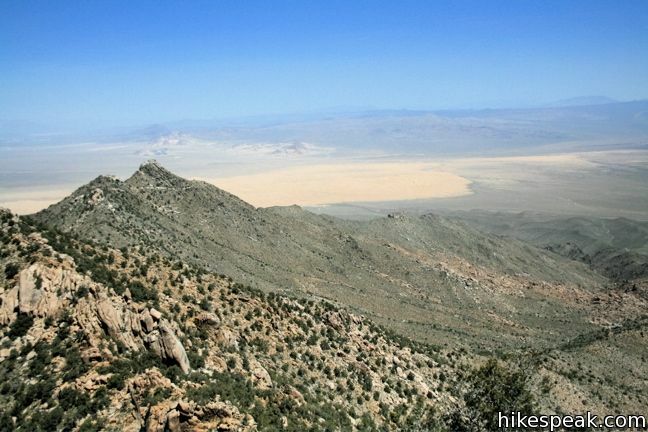 Enjoy the fine view of the Kelso Dunes, Cima Dome, and the Providence Range. 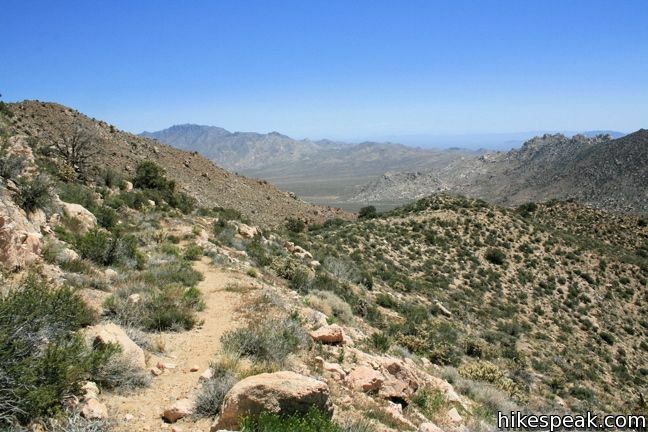 The trail switches back to the south and abruptly comes to and end, 0.15 miles and 250 feet below the summit. Turn right and take the worn path up the side of the mountain. 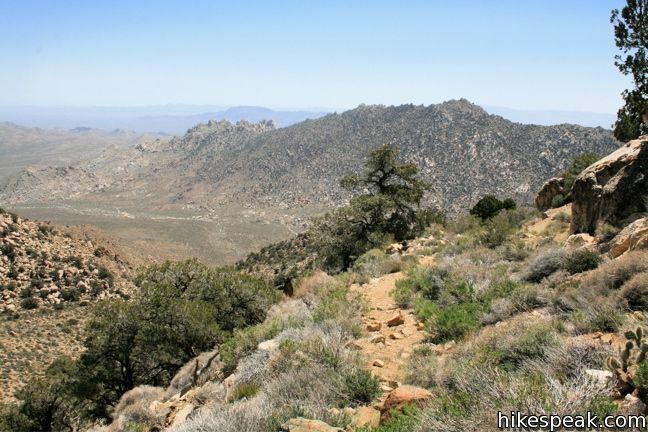 Forge your way over and around rock outcroppings to the top of Silver Peak. At the summit, the trees give way to bolder piles and panoramic views. 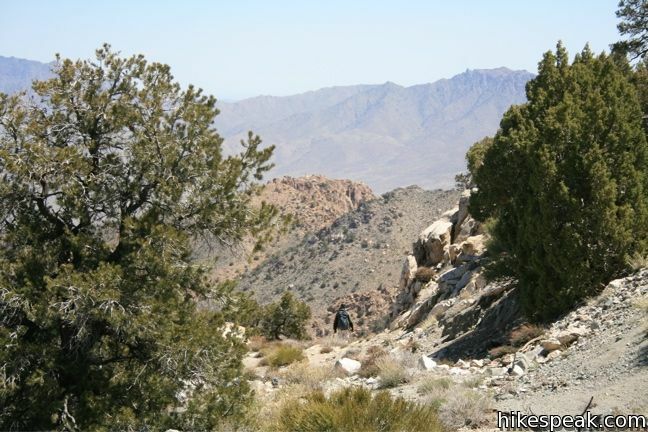 Have a look down at the jeep trail leading back to the trailhead and think of how far you’ve come. The faint path down to the top of the road is harder to follow in reverse, so do your best. Beyond that, the return hike is quick and downhill almost the entire way. 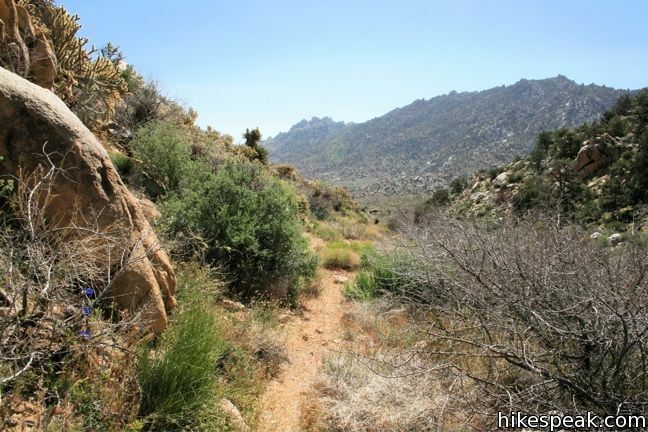 This trail passes through the University of California Granite Mountains Nature Reserve, so stay on trail and be courteous not to disturb their outdoor classroom. 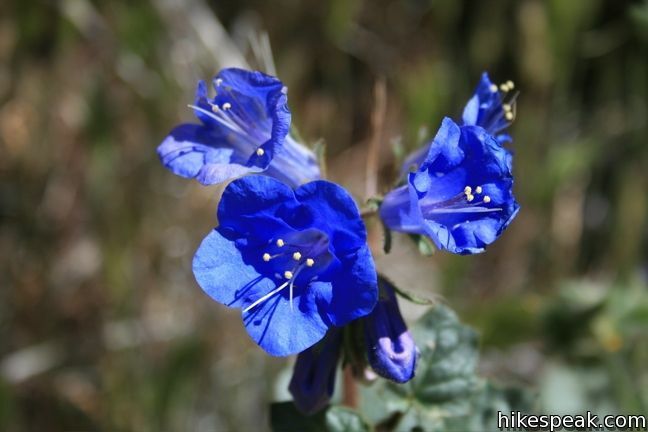 As a commenter notes below, public access may now longer be allowed on the land owned by University of California, preventing hikers from reaching Silver Peak. Observe the ‘no trespassing’ signs. 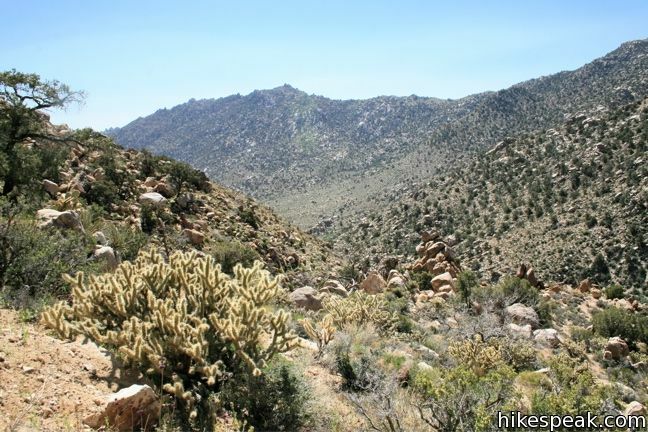 Otherwise, no fee or permit is required to visit Silver Peak or take other hikes in Mojave National Preserve. To get to the trailhead: From Kelso Depot, head south on Kelbaker Road. 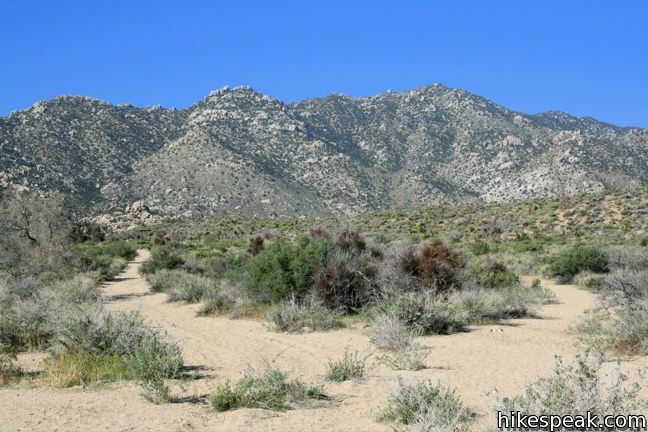 Drive 4.7 miles past Kelso Dunes Road and turn right onto an unmarked dirt road which heads straight across the desert for 1.6 miles to the trailhead. The road is passable for most vehicles. At the end of the road, turn left into the trailhead parking area. 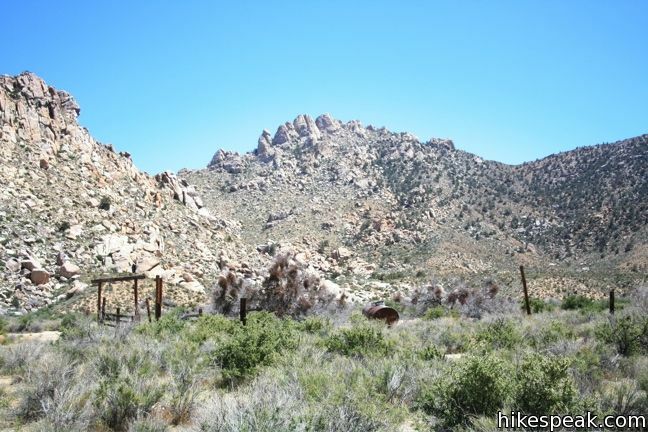 There is roadside camping at the trailhead and in a wash halfway up the dirt road. These photos were taken on a windy day in May of 2010. Click to enlarge. 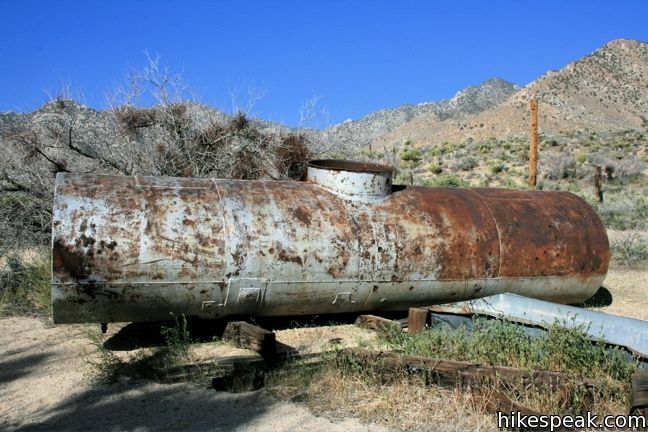 This 11.3-mile hike incorporates Devil's Backbone and Baldy Bowl - Ski Hut Trail into one see-all loop. 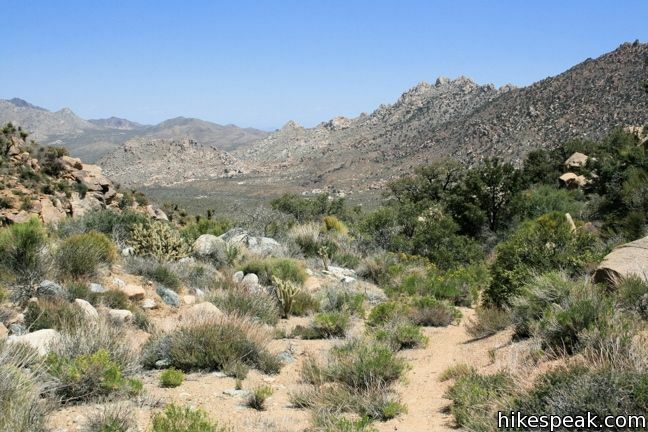 This described hike leads visitors through the UC Granite Mtns Desert Research Center, lands owned not by NPS but the University of California since 1978. 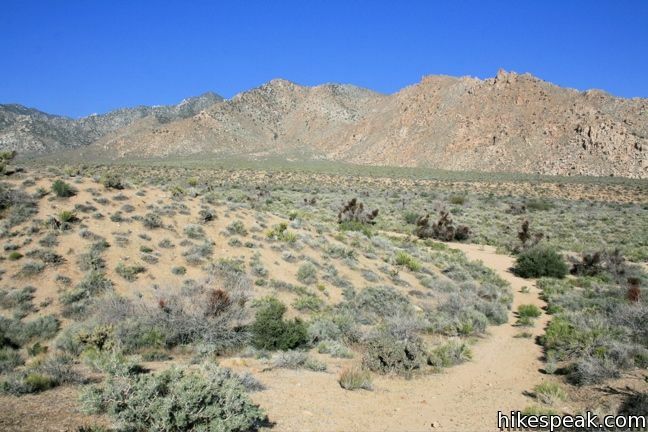 The GMDRC is the location of more than 200 highly sensitive research projects, many used to inform land managers on best science for managing desert lands, such as the Mojave Natl. Preserve. Trespass into the GMDRC is a criminal act, and numerous arrests are made each year. I’d like to stay out of the off limits area. Can I buy a map at Kelso depot? Maps should be available at the Kelso Depot Visitor Center. You can find so easy-to-reach petroglyphs along Kelbaker Road.